If you’re in doubt about attending this lecture talk, you better ask those who were amazed last year by Professor Chehabi’s interesting lecture on Iranian surnames. Dr. Chehabi has kindly accepted our invitation once again to give a talk on an even more interesting topic: Iranian Cuisine! Absolutely hard to resist! 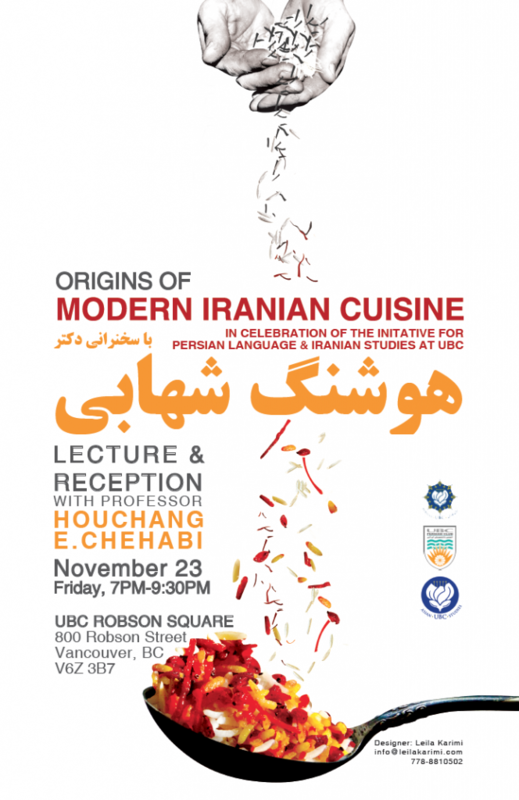 UBC Persian Club proudly invites you to join us in celebrating the success of the UBC Initiative for Persian Language and Iranian Studies with an evening of history, mystery and Iranian food, blended together in perfection!Attention: You may want to have some Ghormeh Sabzi before the event in order to be able to resist the “mouth-watering” lecture. No need to worry! We’ve taken care of that for you. We will have a reception after the talk where the guests will get a chance to mingle while having some delicious Iranian finger foods.